This is the next in a series of sheets from Fantasy Printshop. 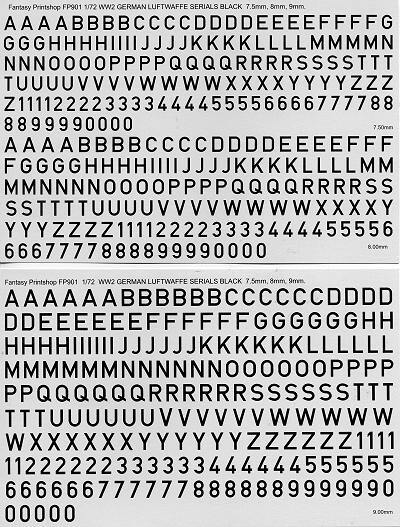 This is a set of German serial number and letters in the style used not only by the Germans, but in some cases, are quite similar to those used by the British as well. These are what would be used for the radio call signs of newly built military planes as well as civilian aircraft. The sheets (and there are two full size sheets) cover markings that are 7.5, 8 and 9mm in size. There are four of each letter and number except for the 9mm size which covers a full sheet and offers six of each. An application sheet is provided to give guidance as to which aircraft would use which size markings. In all, a very handy sheet for those wanting to build something a bit different from the norm and one that I could have used on several previous builds! I should point out that I grey-scaled the scan on these to provide a larger image. The sheet backing is really the usual very light blue.